Los Angeles CityBeat & ValleyBeat cover story “The Radiation Rangers” reveals high arsenic, nickel and vanadium in Runkle Canyon surface water. The Rangers hired Pat-Chem Laboratories to perform Runkle Canyon tests on Title 22 metals in water and soil after the City of Simi Valley rejected their request to inspect the water with them. The City instead cited a faulty KB Homes surface water report with missing data. Meanwhile, the California Department of Health Services answered the citizens’ questions about Strontium-90 in Runkle Canyon. The citizens question CDHS data and results which ignore high Sr-90 readings on adjacent Brandeis-Bardin Institute. 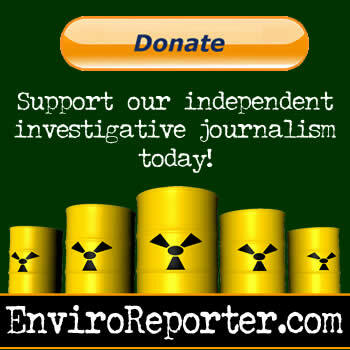 EnviroReporter.com shared Brandeis-Bardin analysis with skeptical City Planner.